Phew! 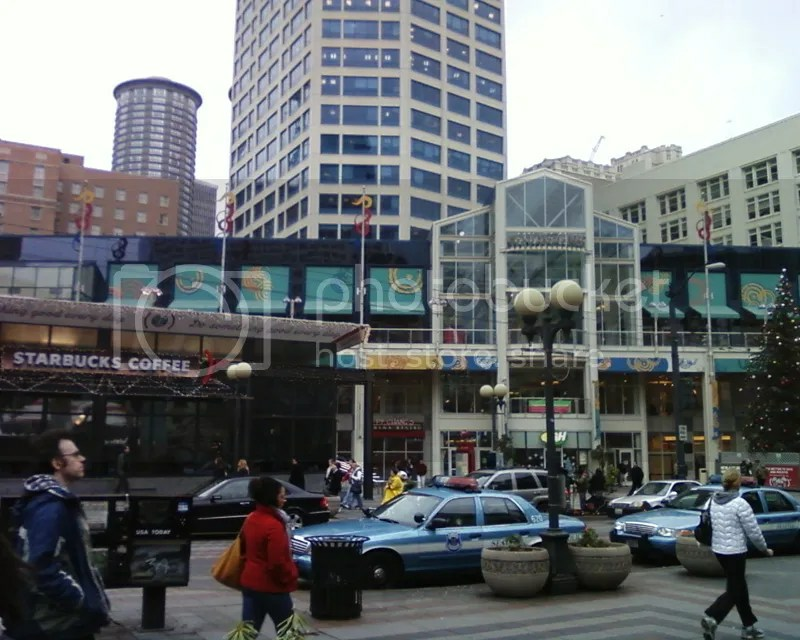 Well, I can’t sleep and I finally got pictures from my phone on to my computer so I though,?Meh, why not write a more detailed entry about my day in Seattle. This time we went early in the morning. Plus! We got a ride from our parents so ahuhu, it was an easy ride to get there. We started off going to?West Lake Mall. I got 2 rings for myself and 1 hat for Ampy! The hat is very cute. 😀 I’m glad I could pay for Ampy hahaha. We didn’t do much at West Lake, walked around look around at the view. And at the town square there was a Merry-Go-Round! It was so cute! I wish I could ride it but?I had no cash? *punch self *STUPID! * Whatever! It’s for kids anyway! Anyway, before leaving West Lake to take the underground bus? way, we stop by?DAISO. I had something in mind when I went in this time, hahaha. I’m not that great at managing my money so I thought of buying a cute looking accounting book? (Is that what you call it? )?to keep track of what I spend on and when. This way I can see clearly how?fricken much money I waste on Johnny’s Entertainment?money I spend. While I was in the shop I suddenly heard?“Taiyou no~!”(Hondai’s reaction)?“*BAM! * Namidaaaa~~~”?with the dance. I laughed with joy because they openedNEWS’s Taiyou no Namida. sha-shing! After paying for that we hopped onto a bus and head to China Town again. We went to Kino Kuniya,?as usual?and get the month?Wink-Up!. This time there was a sale on these little Japanese Novels. Well, well, well, guess what I saw?Twilight?Japanese translated version. Now it’s time for the Japaneses to go on a Vampire wonder adventure and melt over Edward. I saw many other books that looks so readable! The size is so small, it’s like you can keep it in your pocket. I think the Manga’s here need to change the materials they use. The mangas here are too expensive. D: Well, of course I can always read them online but, >_< I’m not much of a Manga on screen person my eyes end up hurting just after 1 chapter. Well, on of the books got my attention from it’s title “Uso, uso”. It meant “Lies?” I start thinking “I wonder what the book is about that it’s name is lies lies”“. I tried reading the first page. end up not understanding a single thing. So I put the book down and look at other books. But while trying reading another book I looked back at the “Uso uso” book and I was like “wait on one minute…?this funny looking boy on the cover doesn’t he look a little like…? 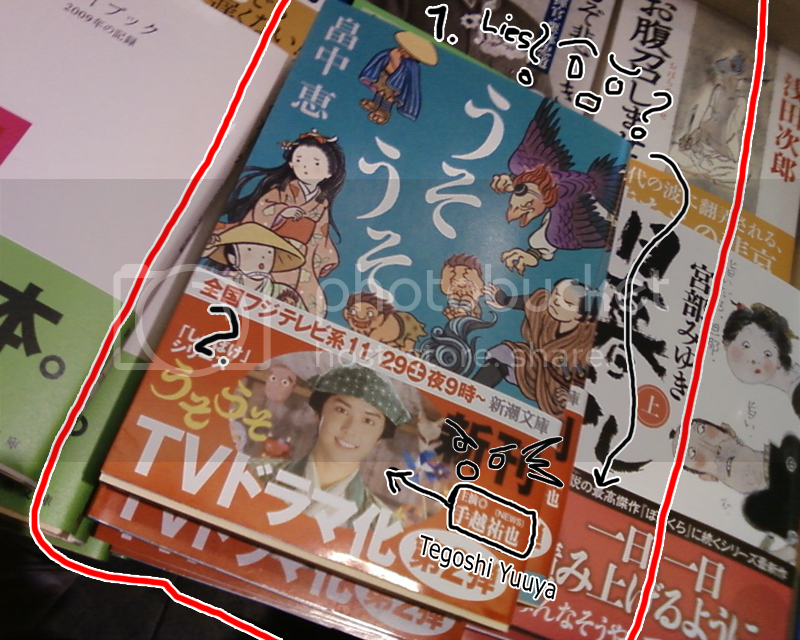 *tries to read it harder*?“TV.. dorama… NEWS Tegoshi Yuya….? !”?I was just like wth! Then I just remembered that Tegoshi played in a drama called?“Shabake”?before. So it was like “Ohhhhh….”. After that my mom came by on her way home from work so we decide to eat lunch together the 3 of us. I ate Orange Chicken and Yakisoba noodles. Yum yum! I even ate some Utopia Frozen yogert. *cough cough* oops. Maybe this is why I won’t heal.